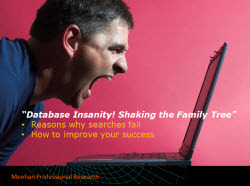 Databases of all types: online, CD published, public or restrictive have opened new avenues to the twenty-first century family enthusiast versus the finger scrolling through a card catalogue. Today, database searches are returning faster results with a higher success rate. But what if it doesn’t? What is the purpose of this database? How effectively can I use it? Are there search tips, search tutorials or site map? What are the strengths of this website? What is the percentage rate of erroneous content?